One of the quintessential smells of summer for me is a bunch of fresh basil — I’m sure I’m not alone in this. When I had gardens in the Midwest, it grew so quickly that I often couldn’t use it all fast enough. In Ireland, though, it’s so cool in the summer that it won’t grow outside at all, which means you either have to be content with whatever you can fit on your windowsill or grow it in a greenhouse or polytunnel. That’s been a huge disappointment for me, since having a nonstop supply of basil throughout the summer was one of the things I’d been looking forward to when we started our garden three years ago. I also couldn’t wait to grow tomatoes, but after losing all of our plants during the past two summers due to record‐breaking rain, we didn’t even bother planting any this year (and good thing too, seeing as how this July was the wettest for 50 years). It’s just another thing that will have to wait until we get a tunnel, hopefully next year. In the meantime, I begrudgingly buy meager packets of fresh herbs, instead of the heaps I’d hoped to be growing myself. But for anyone with basil to spare, and tomatoes too (lucky you! ), this recipe is for you. Still looking for more ways to use up tomatoes? Try Chicken Cacciatore, Tomato and Goat’s Cheese Tart, Oven‐roasted Ratatouille, Spaghetti with Fresh Tomato Sauce or Spaghetti with Roast Cherry Tomatoes, Chili and Basil. This will be even better if you can make it ahead of time, giving the flavors plenty of time to blend together. It would be perfect for a picnic. Bring a large pot of water to boil for the ravioli. Meanwhile, skin the tomatoes. (To do this, cut a shallow X in the bottom of each tomato with a sharp knife, then pour boiling water over them and leave until the skin around the X starts to curl away, about 1 to 2 minutes. Drain and allow to cool, then slip off their skins.) Deseed them and chop them into large pieces. 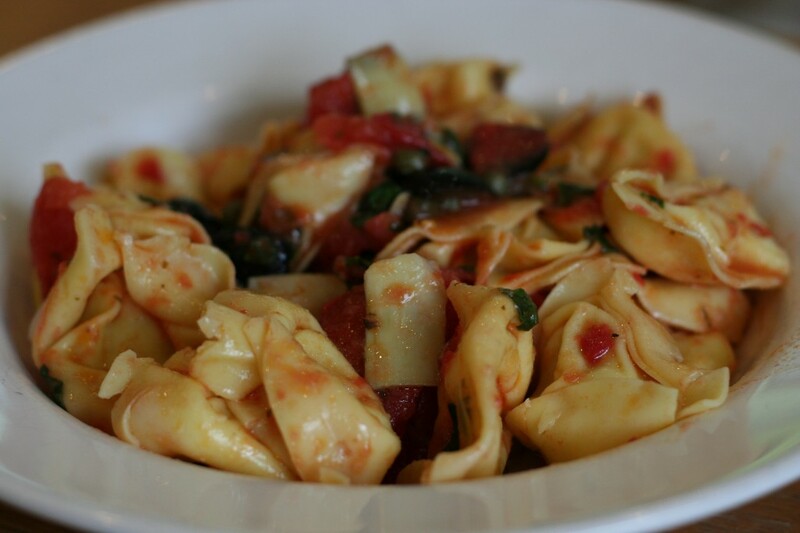 Put the tomatoes and artichokes in a large bowl along with the basil, olives, capers, and oil. Once the water is boiling, add the ravioli or tortellini and cook according to the package instructions, then drain well. Add the pasta to the tomato mixture in the bowl and toss gently with a rubber spatula. Taste for salt, season with pepper and sprinkle with vinegar to taste. Serve warm or at room temperature. In a 1 1/2‐quart saucepan, simmer the water, honey, sugar, and vanilla bean, covered, for 5 minutes. Add the apricots and simmer, covered, until just tender but not falling apart, 2 to 5 minutes (mine were done after 2 minutes), depending on how ripe the fruit is. 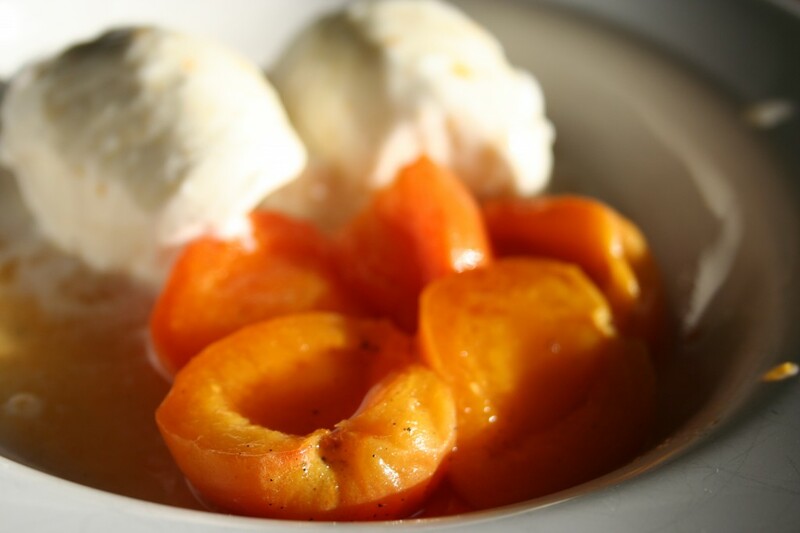 Transfer the apricots with a slotted spoon to a bowl and boil the syrup until it has reduced to about 1/2 cup (120 ml). Pour the syrup over the apricots and chill for 25 minutes. Serve with vanilla ice cream, with the syrup spooned over.